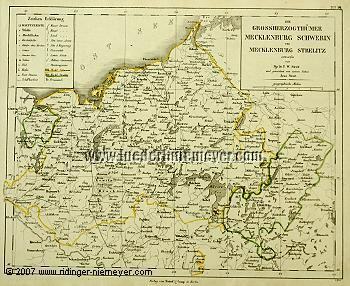 (Mecklenburg Schwerin and Mecklenburg Strelitz, The Grand Duchies.) With title and explanation cartouche. Detail map by Friedrich Wilhelm Streit (Ronneburg, Thuringia, 1772 – Berlin 1839) drawn by Arno Streit in steel engraving of the monogramist L. M. colored in outline. (1833-37.) 9 × 11 in (23 × 28 cm). The coast from Travemünde till Barth , otherwise till Anklam – Prenzlau – Schöneberg – Gartow – Boitzenburg – Lübeck. – With the postal routes.